Sadat X (born Derek Murphy; December 29, 1968) is an American rapper, most famed as a member of Alternative hip hop group Brand Nubian. Originally known as Derek X, Sadat takes his name from former Egyptian president Anwar Sadat. 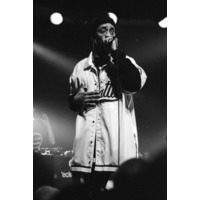 In 1996, Sadat appeared on the Red Hot Organization's compilation CD, America is Dying Slowly, alongside Biz Markie, Wu-Tang Clan, and Fat Joe, among many other prominent hip hop artists. The CD, meant to raise awareness of the AIDS epidemic among African American men, was heralded as "a masterpiece" by The Source magazine.